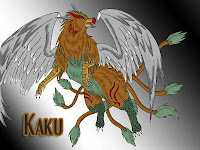 The tailed beasts (bijuu) are giant demons that serve to drive the plot of the Naruto series, referred as "Chakra Monsters" because they are actually living "ultimate chakra", far beyond a normal human's and given physical form. Because of their power, the tailed beasts served as weapons and tools used in Ninja Wars until it ended and several of the tailed beasts were distributed by the First Hokage amongst the five ninja nations as a peace treaty, in order to stabilize the balance of power between nations. They are differentiated by the number of tails they have, with each possessing an amount from one to nine. shukaku has one tail and it is a racoon dog. 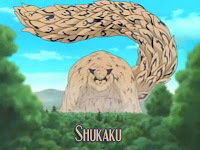 Shukaku was merged into Gaara when he was born. It is able to manipulate the special sand within Gaara's gourd without Gaara needing to control it. The sand can block all incoming attacks that it can react to. The sand can also be controlled by Gaara to form a shell around him or to attack. Shukaku seems to want blood and demands that Gaara kill for sustenance. Gaara believes Shukaku's spirits to be his mother's. A side-effect of having Shukaku within him Gaara is not allowed to sleep; if he does Shukaku will take over him and reform itself out of sand around Gaara as seen during the invasion of Konoha at the end of the Chuunin exams. Much like Naruto the citizens of the Sand Village ignore and try to avoid Gaara, mostly out of fear. Later on, the Shukaku is extracted from Gaara resulting in his death. However, a combination of Chiyo's jutsu and Naruto's chakra brought him back to life. The Shukaku is currently in the hands of the Akatsuki. Nibi is a 2-tailed cat with firebreathing powers. Nibi's Jinchuuriki is a girl named Yugito from the Village of Cloud. She is the second strongest ninja in her village and she has the ability to transform completely into the two tailed demon cat almost at will. The demon cat can shoot fireballs from her mouth at her opponent. Yugito seems to be like what Gaara was to the Sand Village, the trump card of the Hidden Cloud. Unlike Gaara and Naruto, she doesn't seem to have problem with people around her. This hints that the demon in her isn't hated by everyone and she is viewed by others how the Hokage wants everyone to view Naruto. Yugito gets captured by the Akatsuki, just like Gaara, so they can extract the Bijuu out of her. The three-tailed beast is a gigantic, turtle-like demon. The abilities of this creature, at the moment, are unknown. Sanbi is extremely large and also has great speed. What makes the Sanbi unique from the other demons, is that it does not have a host and it doesn't seem to have any sign of intelligence. According to Deidara of Akatsuki, not having a host makes it weaker because it isn't intelligent enough to control its own strength. Other than the fact that this demon has four tails, nothing much else is known, not even what animal it is. The host of this demon was an ederly man. He can be recognized by dark marks under his eyes, most likely from the demon. This man uses many elemental fusion techniques when battling, which could be some of the powers from the demon. 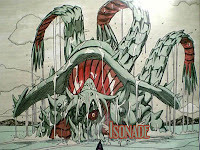 This 4-tailed creature was captured by the Akatsuki after Kisame killed its host. This demon still not known in the episode and manga but lets take a look according to the japanese legend. Houkou is a bijuu which looks like a five-tailed dog. 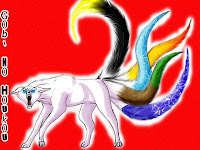 Each tail of this creature represents one elemental power: Wind, Water, Earth, Lightning and Fire. They can cause catastrophic damage when used. 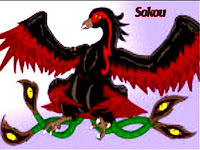 Houkou will willingly destroy the nature to obtain the power he desires from these elements. 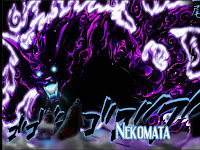 He was once badly injured when he and Nekomata challenged Kyuubi. Strangely enough, he is the god of Illusion. Houkou lives in a giant, ancient tree. This demon still not known in the episode and manga but lets take a look according to the japanese legend. 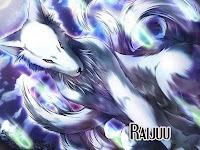 Raijuu, a bijuu in the form of weasel, has four legs and very sharp claws. Its cry sounds like thunder. It was originally the god of Thunder, but because of Yamata no Orochi’s power, it was transformed into a beast. Raijuu can release a huge amount of eletricity for battle assistance. This demon still not known in the episode and manga but lets take a look according to the japanese legend. Tale in the Legend of the Tailed Beasts: Kaku is a bijuu in the form of badger. Its Kanji is also read as Mujina, which is the name the Japanese subspecies of badger (Meles Meles Anaguma) receives in some parts of Japan. 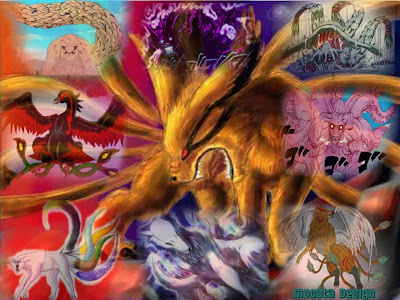 It has seven tails, and is the smallest bijuu out of the nine; though it is the most cunning and stealthy. Kaku hunts its prey underground most of the time. It kills by crumbling/destroying the piece of land that is under its target, making it fall right into his open mouth. Above land, whenever he is around he can transform into any type of creature, but he is unable to do it if he doesn’t have clay. Hacibi no Hachimata is a cuttle bijuu. It has crimsom red eyes and eight tails and has the power of the Demon world, a symbol of evil. It was different with japanese legend that Hachimata is snake bijuu with eight head because in Naruto series this bijuu just have one head looking like a bull with four horn. Beside eight tailed, Hachimata also has two hand. His Jinchuuriki is swords master with lightning chakra elemental, its showed when he fight with Sasuke and team hawk. 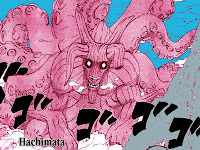 He has the ability to transform completely into the eight tailed demon cuttle almost at will. Sasuke and others almost dead when they tried to captured Hachimata. Hachimata's real power still not shown yet, but I'm sure he is so strong. 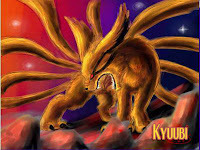 Kyuubi is the 9-tailed fox sealed within Naruto. This Bijuu attacked the village of Konoha 12 years nearly destroying the village and all its inhabitants. The 4th Hokage sacrificed himself, using a technique known only to him and the 3rd Hokage, and sealed Kyuubi inside a baby named: Naruto. Because of the Kyuubi, the villagers ignored Naruto and viewed him as a nuisance leaving him sad and alone. The power of the Kyuubi is so great that when Naruto is cut or wounded chakra leaks from the wound and heals it almost instantly. Naruto is able tap into Kyuubi's power by begging it to let him borrow Chakra. When Naruto becomes enraged the Kyuubi takes over his body and forms a Kyuubi-shaped shell of red Chakra around Naruto. The 8 tailed is supposed to be a a 8 tailed beetle. Its true. I read the other blog they said its a beetle. On the Naruto Shippuden episode next week Saskue joins the Akatsuki and try to go after the 8 tailed beast and its a beetle. The 8 tailed is a beetle because in Naruto Shippuden Japanese. Saskue and his followers join the Akatsuki and go after the 8 tailed beat. And its a beetle. four through seven are all fake! Copy@ 2009 Manga Naruto Movie. Powered by Blogger.